A composite material composed of coarse aggregate bonded together with a fluid cement which hardens over time. To grind it you need a specific grinder which can come in many configurations, the most common being a hand-held Angle grinder. All grinders use some sort of abrasive to grind or polish such as diamond tools or Silicon carbide. KGS Semi Flexible Black Silicon Carbide (type C) discs are ideal for grinding precast and pre-stressed concrete to achieve the require surface finish overall. 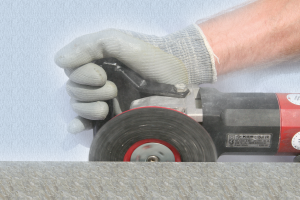 General flat surface grinding on floors, countertops and structural facings: fast removal of aggregate and form imperfections. By removing brooms, the overall surface will not be grinded.